1. 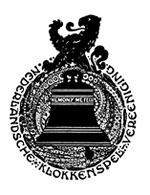 The WCF is a grouping of guilds of carillonneurs and carillon associations (hereafter referred to as "member organizations") which may be multinational, national or subnational. The WCF is a nonprofit organization. 2. Multinational guilds or associations may become member organizations of the WCF if a national WCF member organization does not exist in the territory they cover. 3. Subnational guilds or associations may be members if a national or multinational WCF member organization does not cover their territory. 4. One or more member organizations from the same country may be accepted by the WCF. However, no member organization of the WCF may simultaneously be a member of another world carillon organization. c. the establishment of artistic and musical exchanges. 2. The definition of a carillon is fixed as follows: "A carillon is a musical instrument composed of tuned bronze bells which are played from a baton keyboard". Only those carillons having at least 23 bells will be taken into consideration. Instruments built before 1940 and composed of between 15 and 22 bells may be designated as 'historical carillons'. In principle, the seat of the WCF will be the city where the president resides or in any other place designated by him and approved by the Executive Committee. 1. Three languages will be used: French, English, and Dutch. 2. French will be the official legal language (however, all documents shall be translated into English and Dutch for distribution to respective members). Admission to the WCF can be obtained only by those organizations described in Article 2 of these statutes. 1. To be admitted to the WCF, candidates (guilds or associations) must submit their request for affiliation in writing to the president, enclosing their statutes and the number of individual members in each class of membership described in those statutes. 2. Upon the recommendation of the Executive Committee, and following discussion by the Committee of Delegates, a decision to admit a candidate is taken by secret ballot of the Committee of Delegates. Each member organization desiring to terminate its membership in the WCF must do so in writing, addressing itself to the president, three months before the end of the calendar year. b. by violation of the statutes. The admittance or exclusion of a member organization can be made valid only following an investigation by the Executive Committee and in concurrence by the Committee of Delegates. a. Each member organization must inform its individual members of the statutes and bylaws of the WCF, plus the decisions of the Committee of Delegates and the Executive Committee. b. Each organization shall submit an account of each general membership meeting to the Executive Committee in machine-readable form at the same time it is made available to its own members. This account shall include all decisions taken and the votes thereon, especially changes to statutes, elections of officers, and the election or appointment of delegates to the WCF. c. Delegates to the Committee of Delegates must introduce themselves with written certification from their member organization which attests that they have been designated as delegates. A resigning member organization, or one who has been expelled, is never entitled to reimbursement of sums paid to the WCF. The control of the WCF is assigned to the Committee of Delegates. 4 delegates for a member organization with more than 200 duespaying individual members within its territory. e. to encourage and eventually support artistic events or other campanological activities. The Executive Committee consists of a president, a vicepresident, a secretary for European territories, a secretary for nonEuropean territories, a treasurer and two other members. Apart from the post of president, which is designated by the Committee of Delegates, members of the Executive Committee choose the other officers from among themselves by mutual agreement. f. to report at the meetings of the Committee of Delegates on areas of work during the past years. The committee of auditors is composed of two delegates and one alternate. They cannot be members of the Executive Committee. They are appointed at each World Congress by the Committee of Delegates. 1. A World Congress will be organized at least every four years by the Executive Committee and Committee of Delegates and implemented by a special committee. 2. The Committee of Delegates will meet during each World Congress. 3. At each World Congress, the Committee of Delegates will decide, based upon received applications, the organizer, the place, and the date of the next World Congress. 4. The applications mentioned in Article 20.3 must be received by the president of the WCF no later than 180 days before the World Congress during which the Committee of Delegates will make its decision. A simple majority of the Committee of Delegates can call a meeting of that committee, either at a meeting or by correspondence. One third of the members of the Committee of Delegates must be present to constitute a quorum. To be valid, all elections and decisions must be made by a simple majority of votes by the members present or by their proxies (see also Art. 22). In case of a tie the president will cast the deciding vote. The Executive Committee will issue to members of the Committee of Delegates, 60 days in advance, announcements of meetings which include agendas for same. Members of the Committee of Delegates, who wish to submit additional proposals to the Executive Committee, must submit them in writing 40 days prior to the date of the meeting. The Executive Committee, in exceptional cases, may organize a vote of the Committee of Delegates by correspondence (i.e. mailed ballot). A decision to conduct a vote by correspondence must be carried unanimously. Each member of the Committee of Delegates may nominate himself as a candidate for the Executive Committee by written application, or may be proposed by two other delegates (with his concurrence) in writing. Outgoing members of the Executive Committee may be renominated. Members of the Executive Committee are elected for a period of two World Congresses. One half of the Executive Committee will retire at each World Congress. The election of the president and all other members of the Executive Committee will be by secret ballot. b. donations, subsidies, legacies and occasional gifts. The fiscal year begins 1 May and ends 30 April of each calendar year. Yearly dues must be paid before 31 March. The WCF is not responsible to anyone as regards its possessions. The members of the Executive Committee are personally responsible for their actions to the Committee of Delegates, but to nobody else. All activities of the members of the Executive Committee and Committee of Delegates are voluntary (i.e. without monetary compensation). These statutes may be modified or expanded by proposals from the Executive Committee, by other delegates of the Committee of Delegates, or by member organizations. Statutes and bylaws may be changed by the Committee of Delegates, with a vote of two thirds majority of its delegates present (including proxies). If requested by one delegate, there shall be a secret ballot. a. In order to dissolve the WCF, there must be a threefourths majority vote of Committee of Delegates members present (see also Art. 22). b. Dissolution of the WCF will be automatic if the number of its member organizations is reduced to one. In the event of dissolution, no member organization may demand any property or goods belonging to the WCF nor the return of any paid contributions. Upon dissolution, all funds of the WCF shall be distributed equally according to representation. The disposition of all reports, documents and other possessions, except funds, will be put to a vote. In order to achieve good continuity of efforts, those things not covered in the statutes will be governed by bylaws, established by the Committee of Delegates in accordance with the statutes. All discussions of a religious, political or philosophical nature are forbidden in meetings of the WCF. These modified statutes were adopted by the Committee of Delegates on 7 August 1998 at Mechlin. They replace the statutes ratified on 8 August 1978 at Amersfoort and modified on 5 July 1990 at Zutphen and on 12/14 July 1994 at Chambéry. agreed on another set of modifiations. 1. An Honorary Title may be conferred on individuals who are, or have been, deemed deserving of it. 1. The president or vicepresident opens, presides over, and adjourns meetings of the Committee of Delegates and of the Executive Committee. 2. In the absence of the president, or by his premature resignation, the vicepresident will replace him until he can resume his duties or until the next election. The same is true between the two secretaries. In case of the absence of both president and vicepresident, the oldest member of the Executive Committee will assume the duties of the president. d. an uptodate list of the members of the Committee of Delegates and of the Executive Committee. 4. Minutes of each meeting of the Committee of Delegates will be sent out within 3 months by email by the secretary, amended as required, and submitted to the delegates for approval at the next meeting. Every delegate is entitled to have his/her contribution corrected/recorded in the minutes on request. 5. The treasurer will collect annual dues and will account for the finances. With the approval of the Executive Committee, he will establish a bank account in the name of the WCF. 6. To be valid, all official documents must be signed by the president or vicepresident and one of the secretaries. 1. The president or vicepresident determines the date for a meeting of the Committee of Delegates and/or Executive Committee. He informs the secretaries of this date and the meeting's agenda who, in turn, issue announcements in writing to all members of the Committee of Delegates or Executive Committee at least 60 days in advance. 2. Each delegate to the Committee of Delegates has the right to be represented by proxy if the said person is authorized in writing by his member organization. However, each delegate has a right to carry only one proxy per meeting. This he must present at the beginning of the meeting. 3. In case of emergency, topics which do not appear on the agenda may be proposed by the president or by members of the Executive Committee at the opening of the meeting. They may be included on the agenda only by a favourable twothirds majority vote of the delegates present. 4. Any election of people must be made by secret ballot; for general business matters a vote by raising of hands may be taken, unless those present decide otherwise. Vote by acclamation may also be proposed. 5. Blank votes do not count. An absolute majority is onehalf of the valid votes plus one (see also statutes, Art. 23). 6. In case of a tie in a presidential election, the vote will begin again until a majority is obtained (i.e. the greatest number of valid votes). 7. After each election, the Executive Committee may review the distribution of duties. The new Executive Committee will assume these duties at the end of a session. 8. A delegate may belong to more than one member organization, but may only represent a single member organization as a delegate. 9. A majority of the Executive Committee constitutes a quorum. 1. The Executive Committee proposes the annual dues from members (statutes, Art. 18.e). 2. Members of the Executive Committee have the right to a reimbursement for travel expenses to participate at meetings or, if possible, at other activities of interest to the Federation. Amounts will be determined in advance and approved by the Executive Committee within the limits of the biannual budget (statutes, Art. 18). 1. The bylaws may be amended (modified or completed) by proposal of the Executive Committee or other members of the Committee of Delegates (for ratification procedure see statutes, Art. 35). 2. The Executive Committee will decide on matters not covered in the statutes or bylaws. These modifications or additions are temporary. They will be made known to members of the Committee of Delegates at the next meeting and validated by their vote. 1. In case of resignation, expulsion or defeat of a member of the Executive Committee, this person will remit to a member of the Executive Committee within two months following his resignation, exclusion or defeat, the property of the Federation (money, reports, official seal, etc.) coming from and belonging to the WCF. These modified bylaws were adopted by the Committee of Delegates on 7 August 1998 at Mechlin. They replace the bylaws ratified on 5 August 1980 at Dijon by the Committee of Delegates.